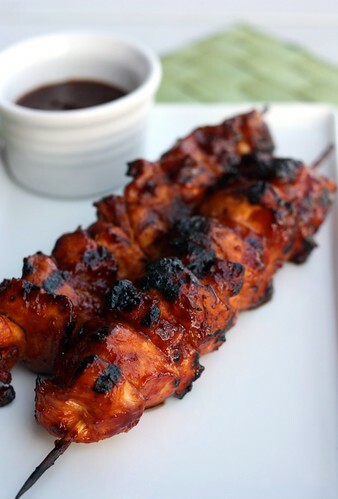 Barbecued Chicken Kabobs – Elly Says Opa! We’ve officially entered the picky eater stage with the toddler. It’s not so much that he’s picky as he is stubborn. It used to be you’d set anything in front of him and he’d devour it. The other day, I set a plate with carrots in front of him (a food I know he loves) and he cried for 10 minutes. Seriously. Getting him to eat meat has never been all that easy (I am unintentionally raising a pescatarian, apparently), but it’s gotten increasingly harder. He made an exception for these kabobs, though. Oh, sure, at first when he saw the pieces on his plate and it was clear that they were NOT some sort of bread product, he gave me the side eye. But I dolloped a little extra sauce on his and then when he finished his piece he asked for more. For this, and many other reasons, these kabobs are a winner in my book. Like most Cook’s Illustrated recipes, this one uses an odd method, too (how do they come up with some of this stuff, seriously?). You process bacon until it forms a paste and then toss it with the chicken pieces and seasoning. The bacon paste does not look especially appetizing, but it does wonderful things. Combined with the smoked paprika, the bacon makes these kabobs nice and smoky. Plus, that little extra fat adds more flavor to the chicken and keeps it from drying out. The sauce comes together in under 10 minutes. You can’t beat that! Made without a lot of hot sauce, it’s a pretty sweet sauce. Normally I’m a spicy sauce girl (which can be achieved by adding more hot sauce, but I didn’t want to overpower it in case Zachary didn’t like it), but it works with these grilled, smoky kabobs. I used less than 2 lbs. of chicken because it’s what we had – probably 1.25 – 1.5 lbs. – but I kept the sauce amount the same and we didn’t have much leftover at all, so you may want to increase the recipe below. These kabobs were so flavorful, and a real winner in our house all around. So, get thee into the kitchen to whip up some bacon paste, stat! If you are using wooden skewers, soak them in water for 30 minutes. Toss the chicken with the salt in a large bowl. Cover and refrigerate for at least 30 minutes, up to one hour. Mix the paprikas, sugar, and cayenne in a small bowl. Process the bacon in a small food processor, until a smooth paste forms, about 30-45 seconds, scraping down the bowl 1-2 times during processing. Pat the chicken dry with paper towels, and then toss the chicken with the bacon and spice mixture. Thread the meat onto skewers. Meanwhile, make the sauce. Combine all the ingredients in a small saucepan over medium heat. Cook, stirring occasionally, until the sauce has reached a ketchup-like consistency and has reduced to 1 cup, about 5-7 minutes. Remove from heat. Set aside 1/2 cup of the sauce to serve with the cooked chicken. Scrape the cooking grate clean with a grill brush. Leave the primary burner on high and turn off the other burners. Place the kababs over the hot burner and grill, covered, turning one-quarter of a turn every 2 minutes or so, until well browned and slightly charred, 8 to 10 minutes. Brush the top surface of the kebabs with about 1/4 cup sauce. Flip and cook until the sauce is browned in spots, about 1-2 minutes. Flip again and brush with remaining 1/4 cup sauce. Continue cooking until browned in spots and cooked through, about 1-2 minutes. Remove from grill and allow to rest 5 minutes. 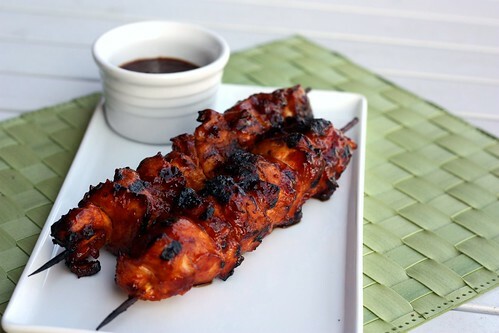 Serve with the barbecue sauce.